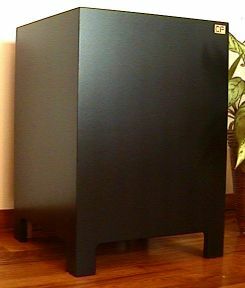 The PDF12V is a vented powered subwoofer. It is powered by a high current 200 watt rms amplifier that powers a 12" diameter, heavy duty, long stroke, 110oz magnet, 3" diameter voice coil, 425 watt, aluminum cast frame woofer. The PDF12V delivers very powerful, low, accurate, defined bass. The ultimate for only! $425.00. 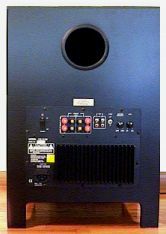 There are a lot of new and established speaker manufacturers today. What makes us stand out from the rest is that we sell direct to you the consumer. This lets us offer unsurpassed quality and service at a fraction of their cost. 12" diameter woofer has a very stiff suspension system that allows it to respond very quickly and accurately to all of the bass program that it receives. The PDF12V is vented at the rear of the enclosure with a large 4" diameter port. This allows enough port area so as not to restrict air movement, and cause air noises. When placed in a corner, or side wall, the rear port reinforces and broadens the low bass. Our FR5S and FR6S speakers do very well without a subwoofer so we had to work hard on developing a subwoofer that would compliment and accentuate these speakers in the deep subsonic bass region. Of course with the variable crossover, phase switch, volume level, and the woofer's high efficiency they will work very well with any speakers, and room that you may have. In conclusion the PDF12V will fill a large room with unbeatable, clean, low bass, and blend with any speakers, and room décor that you may have. As with all of our speakers, the PDF12V has unmatched price to performance ratio.